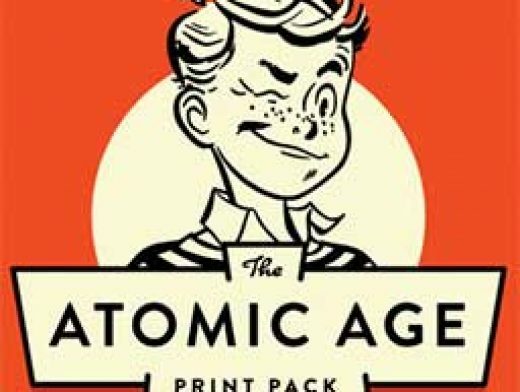 The Atomic Print Pack lets you harness this era. This professionally produced Smart PSD makes it easy to create this effect. Just paste your black design work on one layer (clearly marked in the file) and your color background on another. Save the file and like magic you have the effects you see above. • Get rich, inky black halftones like fresh news print. • Get ink soaked textures that overlay your halftone work for a breathtaking effect. • Get rough edge bleeds just like the old presses. • Newsprint background color can easily be changed. • 100% non-destructive. Make changes to textures, bleeds and aging on the fly. • Never leave the comfort of one Smart PSD file!